Rooms here typically have two queens or one king, and suites–uniquely among the moderates–are available as well. More “business class” rooms will come with the new Gran Destino tower, opening in July 2019. The Cabanas are best for families, and the Casitas for adults. See the map for their locations. I suspect that the tower under construction in the Cabanas area will, once it opens, be part of the El Centro area, keeping the resort at four basic areas, each with its own bus stop. However, the Casitas, Ranchos and Cabanas will remain the only areas with their own dedicated pools. 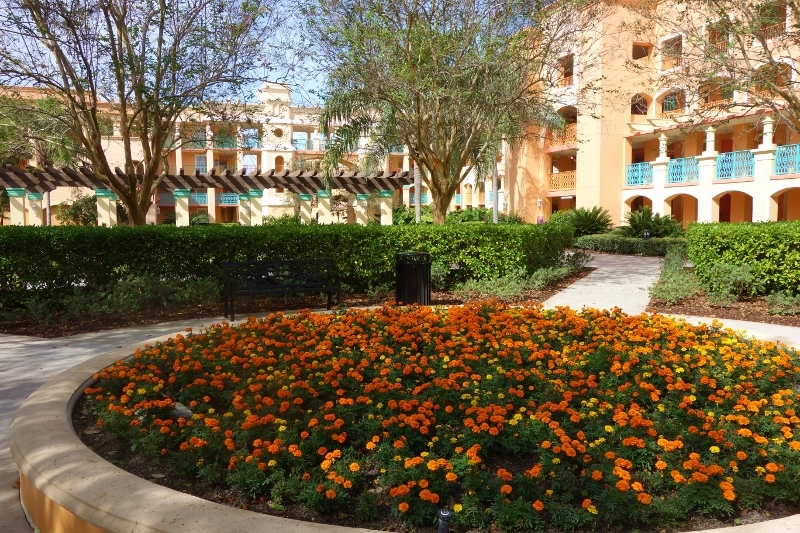 There’s more on the pools at Disney’s Coronado Springs Resort here. 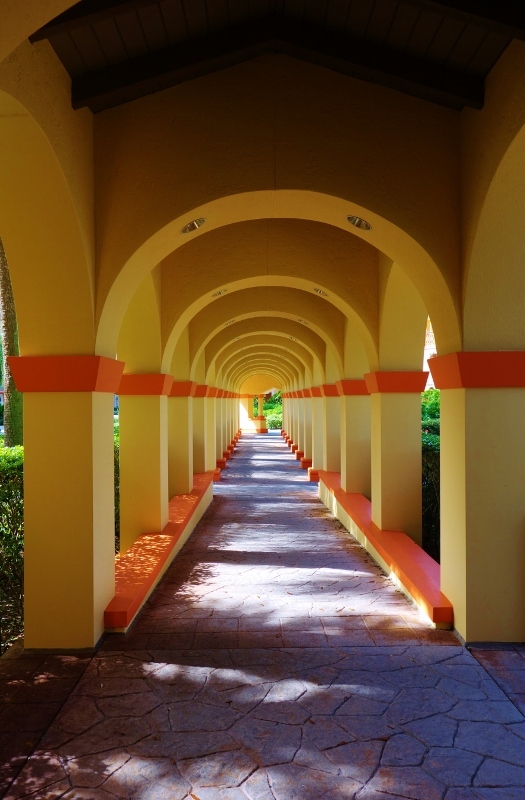 The Casitas, closest to the main building and Convention Center, have the loveliest architecture among these. 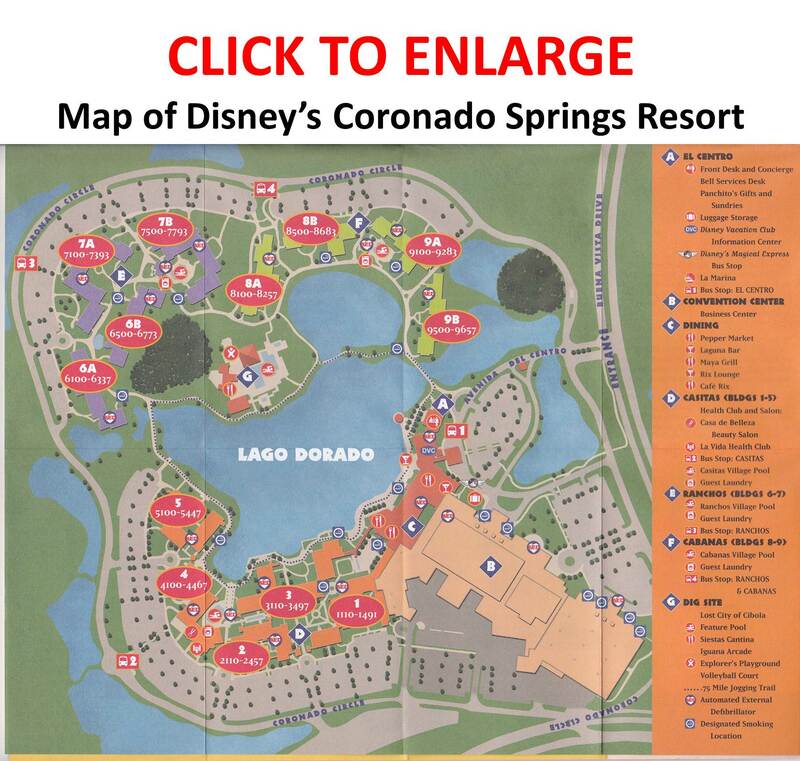 Until the tower opens, The Casitas also have the highest appeal to conventioneers, being both closest to the convention center, and the location of most of the Coronado Springs suites. 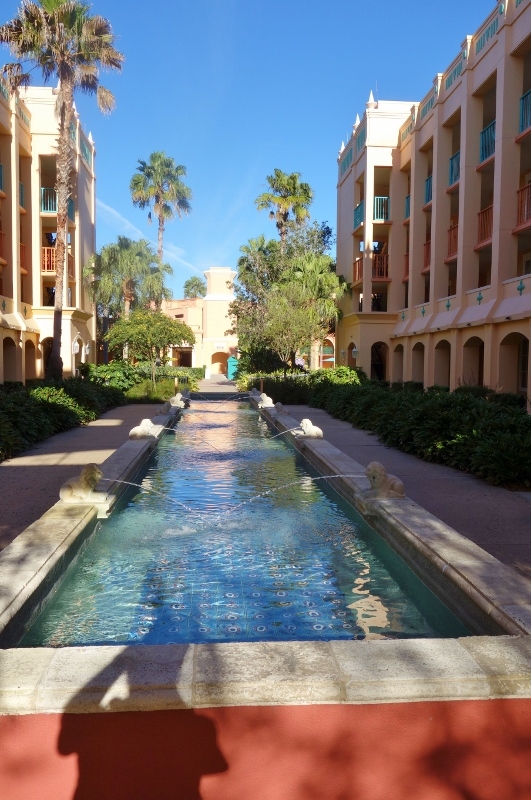 Most suites are in Casitas 1, and there are many lovely courtyards and fountains between Casitas 1 and Casitas 2. Because until the tower opens they are the closest accommodations buildings to El Centro, Casitas 1, 2 and 3 are “preferred” buildings, where even standard rooms come at an extra cost. Note that some rooms in 2 and 3 are still a hike from El Centro. Buildings 1, 2 and 3 are closest to the services at El Centro and to the Convention Center. 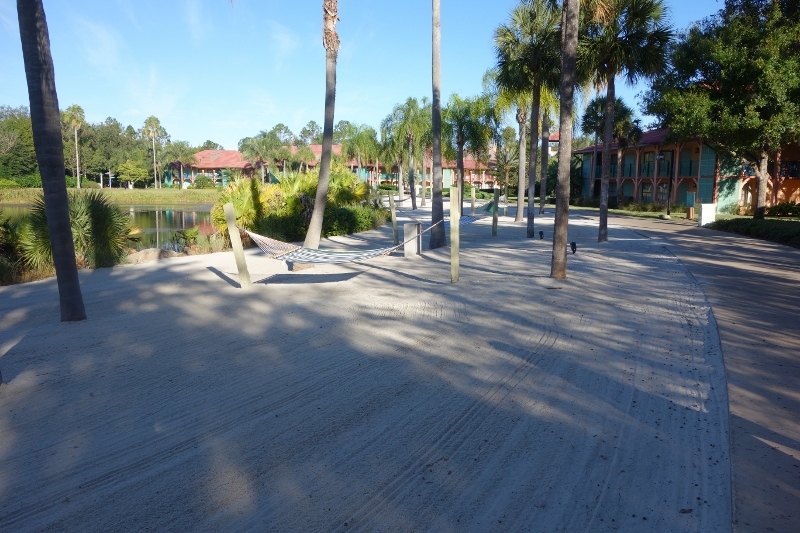 They are also interconnected by covered walkways, very handy in the rain or summer sun. Buildings 4 and 5 are balanced between El Centro and the main pool at The Dig Site. Buildings 2 and 4 are closest to the bus stop. …but look lovely from across the lake. These rooms have the best location for families, being in between the El Centro services and the main pool. 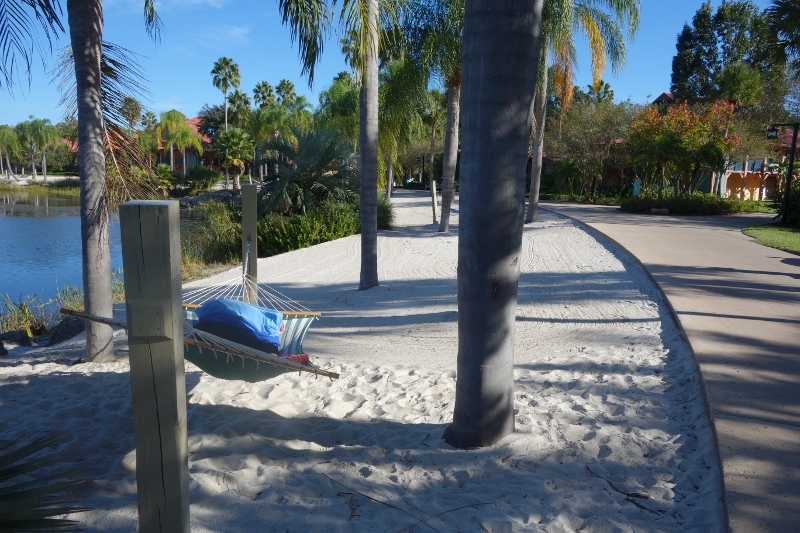 Alone among the three room areas of Coronado Springs, the Cabanas are fronted by beaches. …and the beaches in the morning. 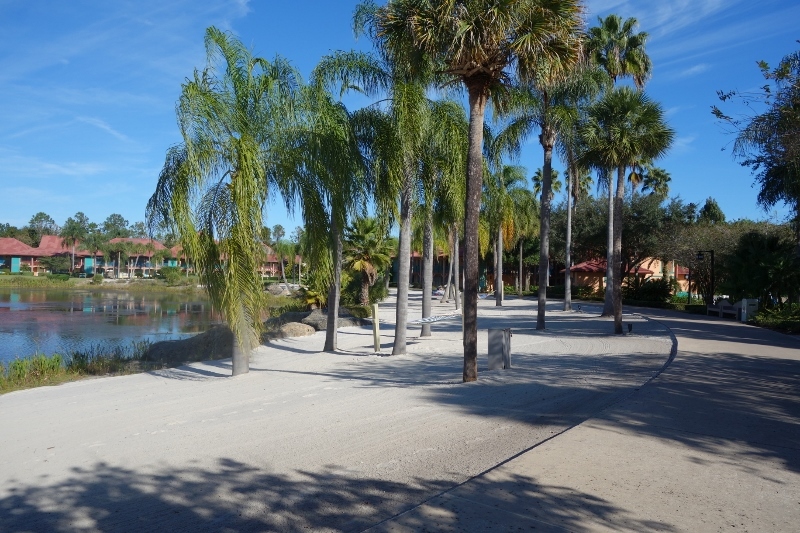 The kid appeal of these beaches and overall convenience to both El Centro and the main pool makes the Cabanas the best area for families, and is why I rate Coronado Springs as the second-best moderate for first-time family visitors. While the former path between Building 9a and El Centro is closed for construction (9b was demolished), 8a is the Cabanas building most convenient to both El Centro and the main pool, and is the best choice for family travelers. 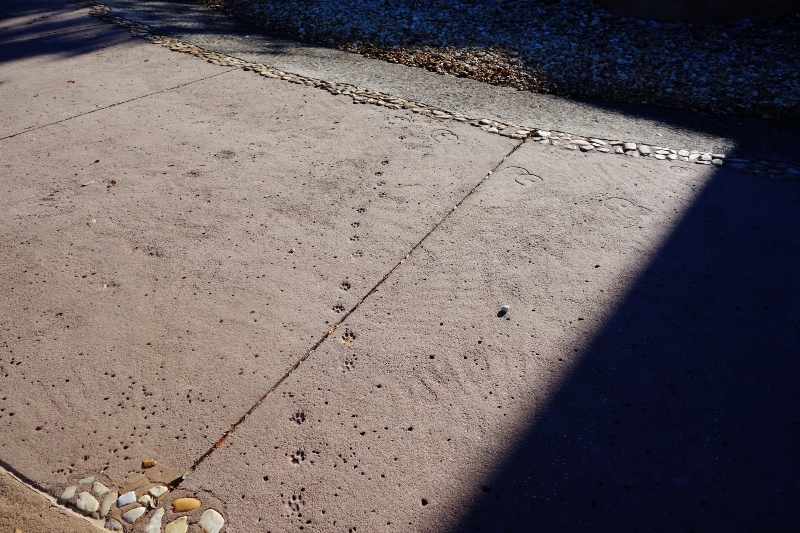 Building 8b is also a fine choice–a little further from El Centro, but closer to the pool and bus stop. 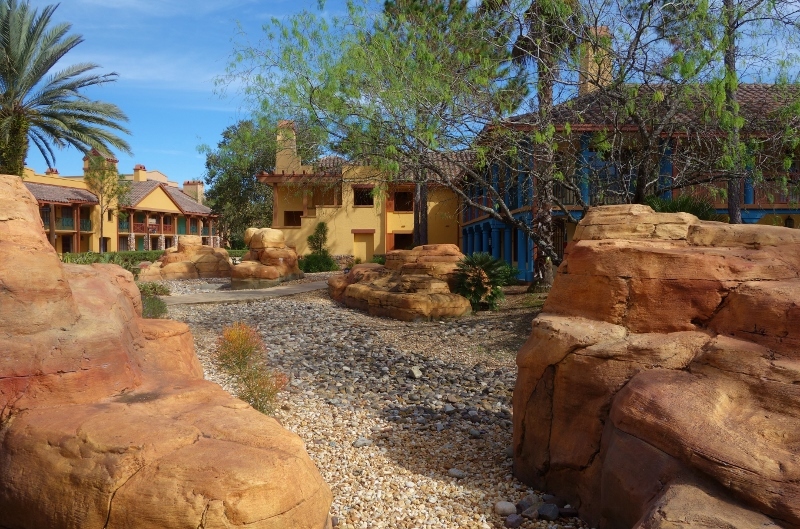 The third area, the Ranchos, has a wilder cactus-y Southwestern theme, which may be a little too realistically arid and barren for some kids to enjoy. 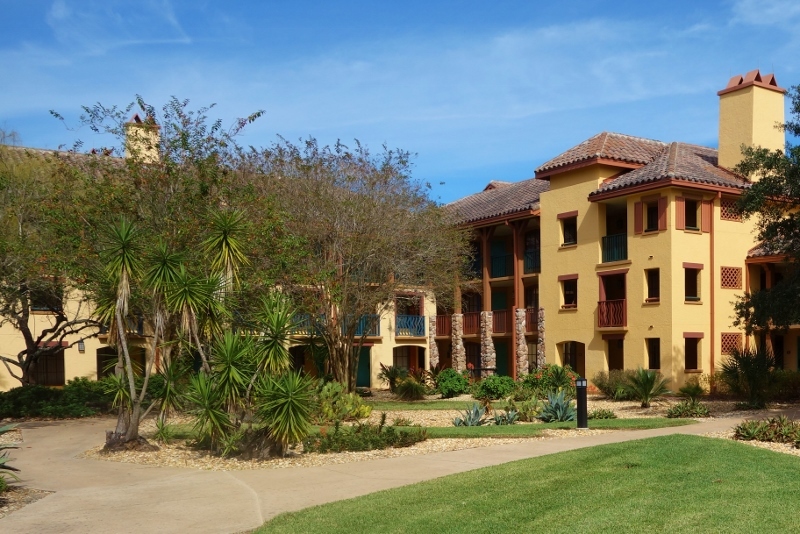 The buildings are meant to reflect the main buildings of old ranches. This works better in the tall buildings, not so well in the two-story buildings. Note the stonework on the columns and the (fake) chimneys. 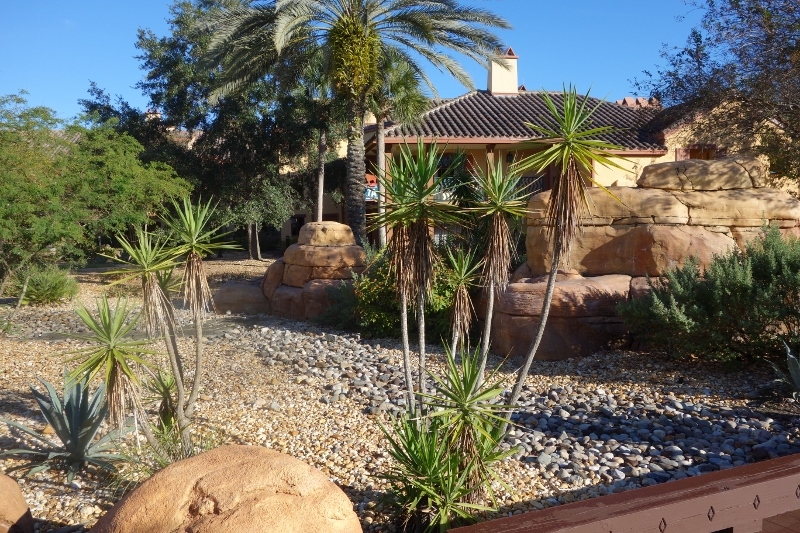 The Ranchos are also a hike from the resort central services and convention center, though some of these rooms are near the main pool. 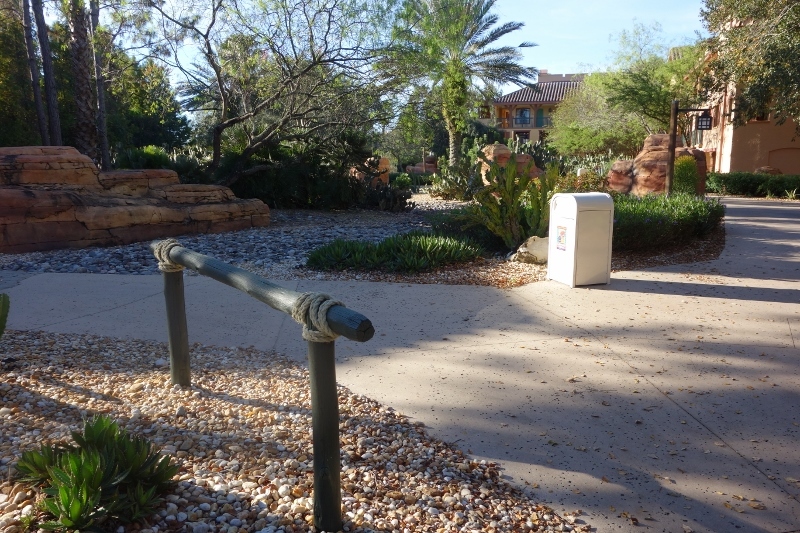 Building 7a is next to the bus stop but is otherwise the most inconvenient building at Coronado Springs. If you are here as part of a team attending a convention, your colleagues are in building 1, and you are assigned by your boss to 7a–well, update your resume. Thank you thank you thank you!!! This article was so helpful!!! I have been reading everything – and this article had it all! My question is, do the busses make multiple stops at other resorts or are they used primarily for CSR? Thanks. 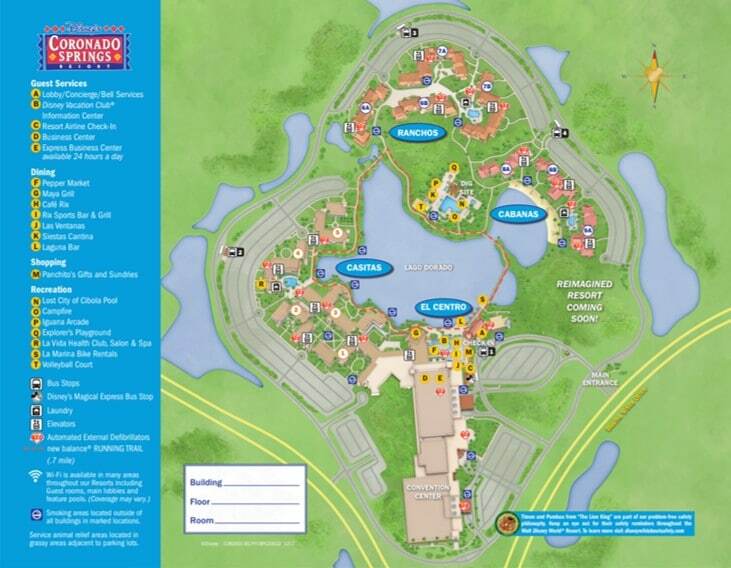 We are staying at CSR for the first time and booked a preferred room (buildings 1, 2 or 3). After reading your review, sounds like we want to stay in the Cabana section instead. We are traveling with our 2 year old which is why we requested a preferred room (bus stop location is important, including where our room is on the bus route.) 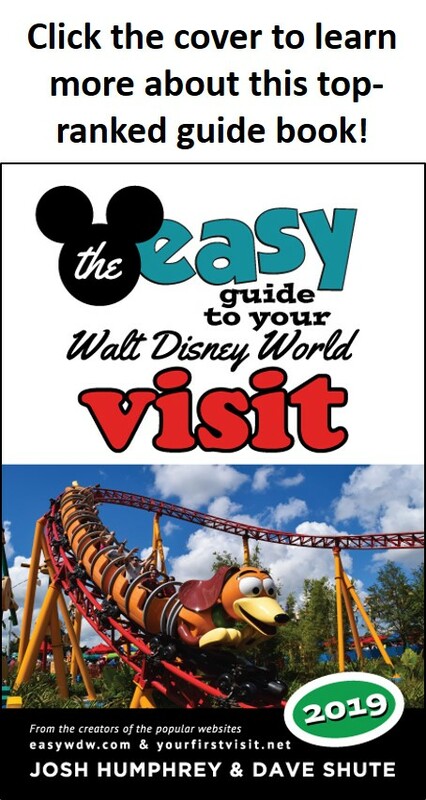 However, I’m concerned about so many stops and it taking a long time to get back to the room after a park day. Monica, while I do recommend the Cabanas, a two year old won’t notice. Bus stop 2 (see the map on first page of the review is just a short walk from Buildngs 1-3, and is the first stop coming back from the theme parks. Tina, the map with the bus stops is here. Depending on your room, you will be using either bus stop 4 or 1. Trying to be on the El Centro side will put you closer to the mug refill station there. And yes, there are connecting rooms! 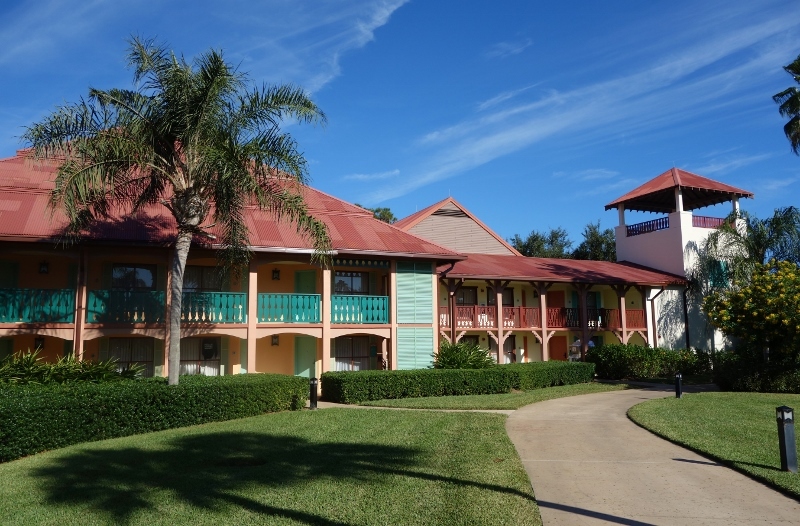 We are a group of 6 (4 adults & 2 children) and are interested in staying at CSR. 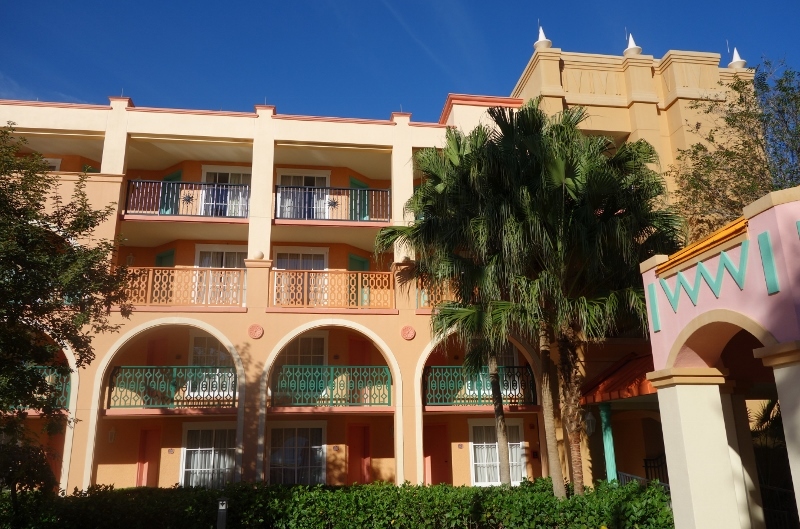 Is it possible to get a Junior Suite & regular room either adjoining or very close to one another? Hi Marina, you can request a corner room. If what you mean is a room with two windows, request that specifically, as I think there are some corner rooms without the extra window (usually because it would show an interior corridor). You can also request a non-parking lot view at the same time. 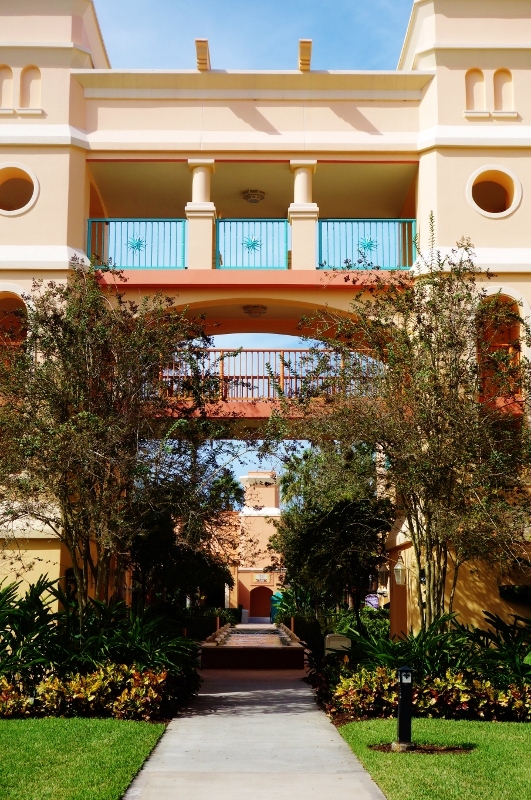 Building 3 in the Casitas has no parking lot views, but is mostly–perhaps all–preferred. Building 6B in the Ranchos has no parking lot views. Most of 8a in the Cabanas has no parking lot views, but a few rooms do have them. We are a party of 5 adults and have been offered either Cabanas, upper floor or highest floor. Never been before so can I ask what you would recommend. Thanks. Hey Phil! I pretty much always recommend the highest floor, as views (whatever they are) are typically better, and there is less noise coming from folk who might otherwise be stomping around overhead. Among the buildings, 8a is probably the best choice.